Materials on the Armoured Corps, Coyote APCs, and a drawing of a Coyote. Uniforms include information on badges, uniforms, and dress insignia, which include 5 hand-written pages of an account on belt buckles and changes to be made. Army Dress Committee Minutes from 1997 and 13 illustrations of badges. The Minutes from the Dress Symposium, December 1959. Pamphlet "Regimental Orders of Dress 1965." Flat badges and Shoulder Flash information. Consists of folders and pamphlets. 8 Student Assessment folders. Exercise for Muskrat Scramble. Tank and infantry operations. Officer Classification Training 1972. Repair Schedule and Times for Rifle 1986. Heating and Ventilation Products. Signal Training, COTC Royal Canadian Army Service Corps Training. Phase I; May to August 1956. Phase II, May to august 1957 and handouts for May to August 1957. 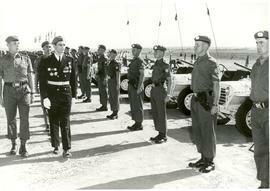 Also included are materials for RCASC Precision 1952-1957 and a Light Armoured Troop Drills. Materials in binder include; 1985 Camp Maps, Command Structures, Operations Orders, and Training Diagrams. A second binder of material on the Fundamentals of AFV Gunnery (Cougar) 1989, pictures, and instructions and Drills. Photocopied articles pertaining to the Hussars over a period of 30 years and Printers copy of the 1973 Sabretache. Included are numerous articles from CFB Gagetown Gazette, newspaper, and original newspaper articles. Materials include 6 pencil sketches by Gary Bowser 1979. "The 8th Hussars Magazine 1979," photocopies of 6 photographs taken near Nicosa or Kyrenia, Cyprus, 2 Change of Command Certificates, and 18 page newsletter and photograph from Egypt. Also included is correspondence regarding NATO. Band materials include sheet music, photographs, and 1 sheet of correspondence. A folder of music includes the arrangement of the " Galloping Hussars." Materials include photocopied pictures, photographs, newspaper articles, and correspondence. Includes material Distribution Lists, notes from an address, Dress Regulations, minutes from meetings, and Allocation lists. Materials on planning minutes for the 125th Anniversary, brochures, newsletters, drills, and Nominal Rolls for parade participants that include 2 folders, 1 book, and 11 binders. Folders include Situation Reports, General Invitations, and a large book of Attendees with signatures and addresses. Materials in binders include "The sunset Ceremony," After Action Report, Royal Review, 100 Man Guard of Honour, Invitations and Programme for Regimental Review, and Sunset Ceremony, and Committee Meetings. Numerous photocopied pictures and a brief history of the militia with some publicity information. The Militia Nominal Roll for 1973. An annual training plan for 1986-87 and a small pamphlet on Constitution and Mess Rules. Materials include letters and invitations. Photographs of inspections and reviews. Printed materials for the formation for reviews. Included are newspaper clippings and building and planning of CFB Gagetown. Included materials are letters of Patent for the formation of the Association. Records regarding the setup of the Museum. Also includes the agreement with Virtual Museums of Canada. Paperwork in reference to the Appointment of HRH Princess Anne as Colonel-in-Chief. Photographs of HRH Princess Anne during her visit to the Regiment.